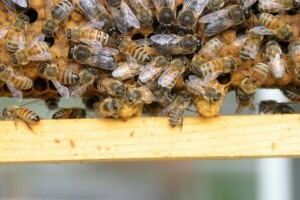 Capped queen cells; A new queen will emerge 16 days after the egg is laid. I checked my hives 7 days after making splits into 4 frame nucleus hives, and was pleased to see the bees doing what they ought to be doing–making queens. I should not have been surprised to see capped queen cells after only 1 week, but I had made a math error. The new virgin queen will emerge at day 16, counting from when the egg is laid. BUT, it takes 3 1/2 days for an egg to hatch into a larva…AND all new larvae are fed royal jelly for 3 days. At day 6 1/2, if a worker larva continues to receive royal jelly, she will grow into a queen. I had forgotten about these 6 1/2 days when I made the split, and was surprised when I saw capped queen cells after only 7 days of the nucs being queenless. As usual, these worker bees did the best things given the circumstance, and chose the most mature larva possible to raise a new queen. Good for them! I moved one of the frames with a capped queen cell into to the top of my Ulster observation hive and checked frequently for when she emerged. She came out 11 days after the split. That means that my nucs will have mated, laying queens 7 days earlier than I expected. That’s great news! 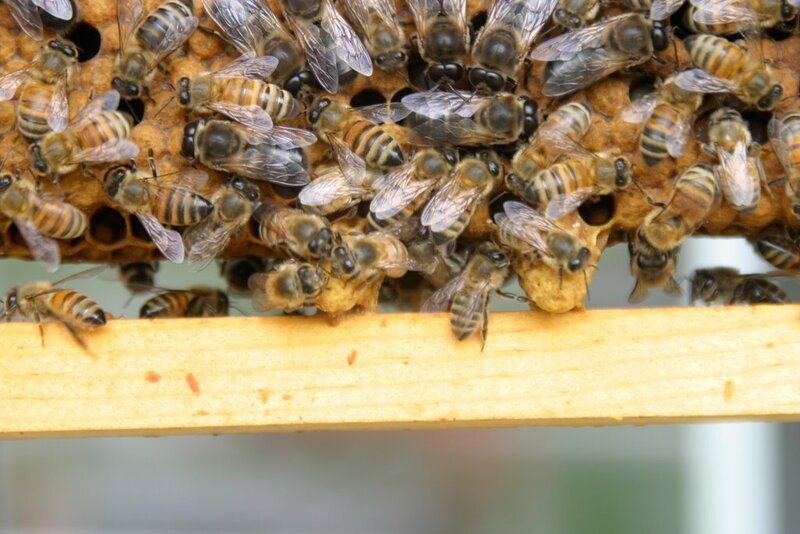 This entry was posted in Beekeeping and tagged emerging queen, hive split, nucleus hive. Bookmark the permalink.